Hello Folks, UC has announced the offer in which you can win Amazon and Flipkart Gift Vouchers Everyday for Free. This Amazing offer is limited time deal. So, grab it fast and collect gift vouchers. UC super day offer is applicable only for the PC users neither for the Android nor iOS users. We always here to give you the awesome and amazing offers everyday so any deal never missed by any you. See the full details and information regarding this offer. When this offer opens the first time then the gift vouchers they give only you can used it on Amazon but this time you can use Gift Vouchers for the Flipkart too. Now, We will guide you to how to get free Amazon and Flipkart Gift Vouchers for free. This steps also helpful for those who never participated in this offer before. Click here: Download and Install UC Browser. Now look at the banner UC SUPER DAY at the first page when you'll open UC browser. A pop-up window will open when you clicked on UC Super Day banner. Click on DRAW Button to get your free gift voucher. 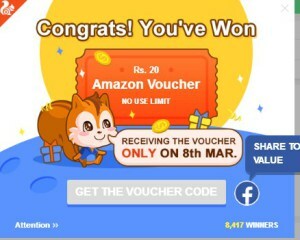 Now, If you will lucky then you'll get free amazon and flipkart voucher. Normally, Most of the contestants won Rs. 20 Gift Voucher. You can also do the same above steps on 8th March to get another free Gift Voucher. 1.1. The Promotional Event is a part of an advertising campaign for the Organizer and is focused on growing awareness on its services, forming or maintaining public interest towards them and promoting them in the market. 1.2. The Event is not a lottery or other risk-based activity and does not itself aim at profit making and is conducted in accordance with these rules of conducting Promotional Event (the “Rules”). The Event takes place in India in the Internet for all India users of UC Browser. The organizer of the Event is UCWeb Group of Companies (the “Organizer”). 4.1. The Event will be held [from 9th FEB. , 2017 to 15th FEB. , 2017] (both dates inclusive) (the “Period of the Event”), users shall follow the directions and rules set forth in the campaign page to participate in the Event. 4.2. Picking the Winner – picking the Winner randomly and automatically from the Participants. The Participant might receive a notification whether he/she is a Winner after clicking the button on the draw page or sharing the campaign page or doing other action according to the directions and rules set forth in the campaign page. The Winner means the Participant who has received a notification that he/she is a winner. The decision as to who is a Winner lies at the sole discretion of the Organizer and the said decision is final and binding on all Participants. 4.4. All actions contemplated by these Rules are completed and recorded by the Organizer at the time of India Time. Any time specified in these Rules should be considered as time of India Time. Postponing or advancing might happen considering the network environment and the time difference, the final launching time depend on the actual situation and lies at the sole discretion of the Organizer and no disputes will be entertained in this regard. 5.1. If the Participant has received a notification that he/she is a Winner, the Organizer will request the Participant to provide his/her address or other contact information, identity information or certificates(“the winner’s information”) at the Organizer’s request to receive the Award through the notification page or through other way that the Organizer recognized before [ 15th FEB. 2017 ]. Only Indian address is valid. 5.2. By sending a request to the Participant to provide the winner’s information the Organizer sends an offer to enter into an agreement on the receipt of the Award. By submitting the contact information to the Organizer the Participant accepts the offer and enters into an agreement with the Organizer. 5.3. If the Participant fails to submit his/her winner’s information to receive the Award as required by these rules, the Participant will be deemed to have refused the Award and waived any and all rights to claim the receipt of the Award. 5.4. Any Award in eVoucher (coupon\recharge code, etc) will be send to the winner via the event page of “My Prizes” within the period specified in clause 4.3. hereof; and any Award in kind will be send to the winner by mail to the address specified for the delivery of the Award within the period specified in clause 4.3. The delivery of the Award is exercised at the expense of the Organizer and the date of delivery shall be the date of transfer of the Award to the post service. Certain of kind Award may need winner’s in person delivery, the winner shall go to the designated address to obtain the Award in person according to Organizer’s requirement. 5.5. The Award is regarded delivery when Organizer has mailed the Award according to the contact information the winner submitted, or when the ownership of the Award was transferred to the winner for Direct to Site delivery. 5.6. The Organizer shall not be responsible for any Award related application process and expense, including but not limited to the registrations, the insurance, the tax. 5.7. The Organizer shall not be liable for information incorrectly given by the Winner. If the Organizer cannot contact the Winner at the indicated contact information and the Winner does not get in touch with the Organizer during the period specified in clause 5.1 hereof, the Winner is considered as having refused from its status as a Winner and from the rights to claim for the receipt of the Award. 6.1. UC Browser users who are located in India and comply with these Rules and meet the requirements established by the Rules are called the Participants. 6.2. The Participants of the Event must be persons capable of entering into contracts and who have attained the age required by law to participate in such activities in accordance with the national legislation of the Participant. 6.3. The Participants of the Event cannot be employees and representatives of the Organizer, affiliated with the Organizer persons, their family members as well as employees and representatives of other entities involved in the organization of the Event as well as their family members. 6.4. The Winner has a tax duty to pay the income tax for the Awards in accordance with the applicable law unless otherwise agreed by the Organizer. By taking part in the Event the Participants are considered as duly informed about their tax duties. 6.5. The Participants have the rights and obligations established by the current legislation of India and by these Rules. 7.1. The Awards shall subject to the rules set forth in the event page. The quantity of the Awards is limited and only the Winners will receive the Awards. 7.2. One Participant cannot win the kind Award more than once. 7.3. Awards are not transferrable and cannot be exchanged, replaced and redeemed for cash when initially transferred to the Winners by the Organizer, unless otherwise agreed by the Organizer. 8.1. The Participants other than the Winners of the Event do not provide any Contact information to the Organizer. 8.2. The Winner provides the Contact information to the Organizer based on the agreement on the receipt of the Award. 8.3. While submitting the Contact information to the Organizer to receive the Award, the Winners consent to the processing and cross-border transfer of the Contact information by the Organizer or parties engaged by the Organizer, in a strict accordance with the goals set out in these Rules. 8.4. The purpose of the Contact information processing is to enter into an agreement on the receipt of the Award with Participant and ensure the delivery of the Award. Awards which have not been requested by the Winners are recognized as unclaimed and may be used by the Organizer at its discretion. 10.1. The Organizer shall not be liable in relation to the quality of the Awards. Any claims of the Winners shall be made in accordance with the warranties provided by the producers of the Awards. 10.2. The Organizer shall not be liable for the actions of third parties including post services. In case the Award sent by post was lost or damaged under the fault of the respective post service, which was confirmed by the respective documents, the Organizer shall not be liable for the loss of the Award sent to the Winner. 10.3. The Organizer shall not be liable for the delivery of the Award to inaccurate or non-existing address because of indicating such an address by the Winner. 10.4. The Organizer shall not be liable for third parties’ imitation of Organizer or the employee of Organizer, fraudulency or asking for personal information of the users. Users shall pay attention to all the said behavior and call the police and apply to other law enforcement bodies in case of infringement of their rights. 10.5. The Organizer shall not be liable in the event of force majeure (such as natural disasters, acts of the government, serious network attack, system error for suspension). 10.6. The Organizer reserves the right of final explanations of these Rules in the event the users find them unclear.